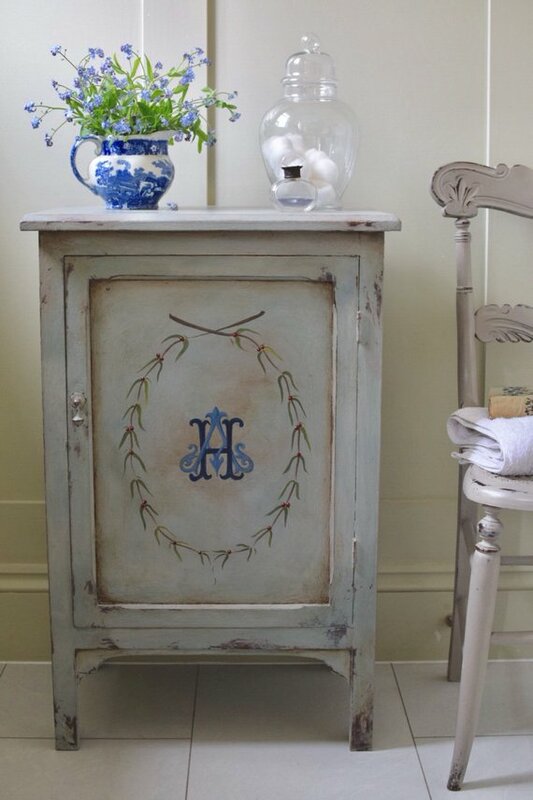 Distinctive small pot cupboard hand painted and blended in Annie Sloan shades of French Linen and Louis Blue, then lightly distressed and embellished by hand, using a fine artistry brush to create a monogram in shades of Napoleonic and Louis Blue, with bespoke blended colours for wreath and berry detail. The whole piece is redolent of a French brocante find. This little cupboard is a really useful size and an elegant shape that can double as a bedside table, bathroom cabinet or sofa end lamp table. Painted inside in Primer Red for a shock of vibrant contrasting colour that really picks up on the juicy berries I’ve hand painted to pop with colour around the carefully hand painted laurel leaf wreath. Handy shelf inside means you can fill it with towels and toiletries in the bathroom or guest room or place beside the bed with water glass/jug set.